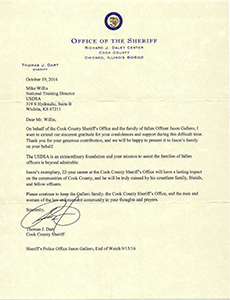 United States Deputy Sheriff's Association is honored to receive letters and testimonials from outstanding law enforcement offices and agencies around the country. 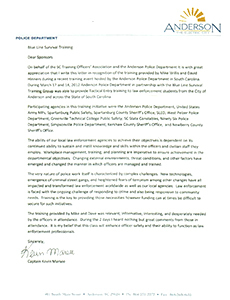 The ability of our local law enforcement agencies to achieve their objectives is dependent on its continued ability to sustain and instill knowledge and skills within the officers and civilian staff they employ. The very nature of police work itself is characterized by complex challenges. Training is the key to providing those necessities however funding can at times be difficult to secure for such initiatives. The training provided by Mike and Dave was relevant, informative, interesting, and desperately needed by the officers in attendance. It is my belief that this class will enhance officer safety and their ability to function as law enforcement professionals. 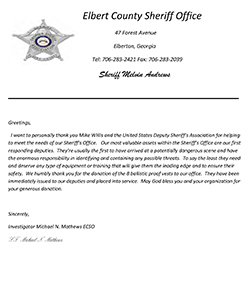 I want to personally thank you Mike Willis and the United States Deputy Sheriff’s Association for helping to meet the needs of our Sheriff’s Office. Our most valuable assets within the Sheriff’s Office are our first responding deputies. They’re usually the first to have arrived at a potentially dangerous scene and have the enormous responsibility in identifying and containing any possible threats. To say the least they need and deserve any type of equipment or training that will give them the leading edge and to ensure their safety. We humbly thank you for the donation of the 8 ballistic proof vests to our office. They have been immediately issued to our deputies and placed into service. May God bless you and your organization for your generous donation. On behalf of the Cook County Sheriff's Office and the family of fallen Officer Jason Gallero, I want to extend our sincerest gratitude for your condolences and support during this difficult time. Thank you for your generous contribution, and we will be happy to present it to Jason's family on your behalf. The USDSA is an extraordinary foundation and your mission to assist the families of fallen officers is beyond admirable.